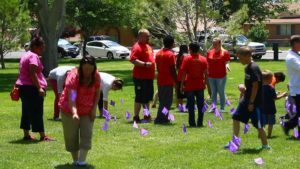 ST. GEORGE — Foster parents and foster children gathered in the southwest corner of Vernon Worthen Park Friday for a “March for Kids” event to celebrate National Foster Care Month. The gathering was to honor foster parents. Games, a bounce house, live music, food vendors and crafts kept the children entertained. An information booth was set up to help inform those that might be interested in becoming a foster parent. Ben Ashcraft, Southwest region representative for Utah Foster Care, said the main purpose of the event was to honor the hard work and dedication of foster parents. 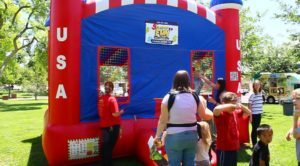 “We invite the community to come out and learn more about foster care and actually celebrate and acknowledge all the hard work that goes into doing foster care,” he said. During the event, Ashcraft presented a “Foster Mother of the Year” award to Tifiny Rose. Tifiny Rose and her husband, Earl Rose, have fostered over 40 children in the past 17 years and focus most of their efforts on special needs children. Six of their children have cerebral palsy. Tifiny Rose said she drew inspiration from the movie “A Home for Annie.” Before seeing the film, she said she did not realize how many children were in orphanages in the U.S.
“I called up my husband and said, we’re going to do foster care,” she said. Earl Rose said there are challenges with every child, but there may be additional problems that foster children bring with them. There may be physical or mental disabilities and issues of abandonment or neglect to name a few, he said. Not only do the Roses raise foster children, but they also own the Breakfast at Tifiny’s creperie, which Tifiny Rose runs. Earl Rose works full time for the Washington County Sheriff’s Office. Tifiny Rose said the biggest surprise she has faced since becoming a foster mother is realizing that it takes more than just love to help a child. Having the strength to let go when the children are returned to their biological homes is essential, especially when they are returning to less-than-ideal situations. “You need to have the ability to get over the loss of children leaving when they come and go out of your home,” she said. Earl Rose said raising foster children means that parents cannot think only of themselves. Despite the challenges, helping children have a safe home is absolutely worth it, Earl Rose said. Mike Millgate and his wife have been involved with foster care for eight years. The biggest challenge for them is emotional, Millgate said. If your heart and mind are in the right place, the benefits of being able to help children far outweighs any of the negatives, he added. 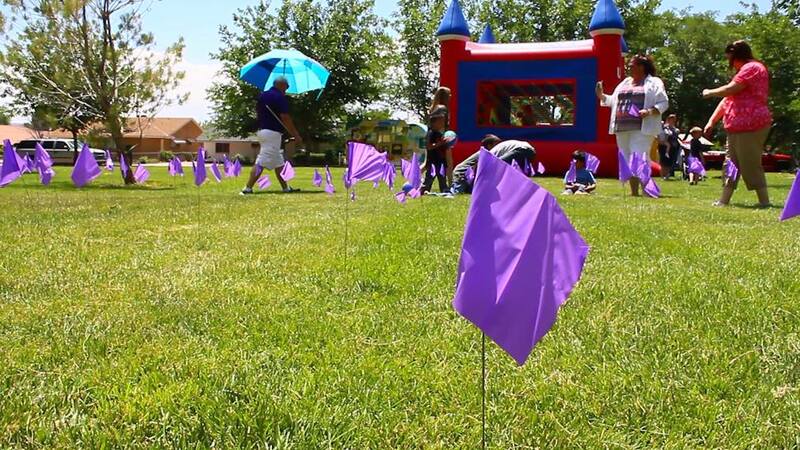 In the St. George area, there are approximately 45 families involved with Foster Care Utah, Ashcraft said, with approximately 120 families in the region. Yet that isn’t enough to find homes for all the children in need. When people sign up to be foster parents, they are almost immediately assigned a child. 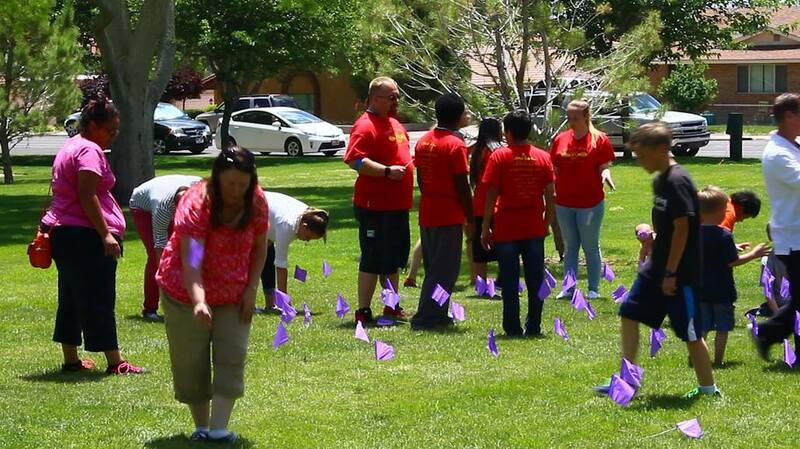 Approximately 100 children are in foster care in the St. George area, he said. For those who are interested in becoming foster parents, there are a few restrictions. Applicants can be single or married, but cannot be cohabitants. The parent or parents must be financially and personally stable, physically healthy, pass a background check, have adequate living space for the child and must be willing to open their heart and home to a child.